When you are planning a party, whether it is your wedding day, or just a few friends for drinks and, you want live music, you may never have booked a band before. So here are 25 of the important things to consider. The type of music at your party is probably the first question that should be considered because there are often a wide selection of guests of varying ages, so something that does not alienate one section of guests is advisable. If its a drinks reception for people to mingle and talk then a heavy rock band may not be appropriate whereas a string quartet may not be the best for after dinner when people want to get up and dance. 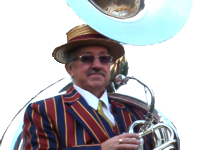 Jazz bands go down well with all ages, read on, these booking tips apply to all types of band. If you are in a small room then musicians with amplified electric instruments, or a brass ensemble, may be overpowering and conversely in a large marquee with interior draped fabric would swallow up a lone harpist. An acoustic jazz band can perform in many sizes of venue from someone's front room to conference halls, but may be too loud in a sports hall due to hard walls and no soft furnishings! A singer is fairly important for the main evening entertainment when a “show” is required. However for incidental background music a singer can become intrusive. Acoustic Jass doesn't have a singer but do play for concerts, dancing etc. better for the more intimate venue. You need to find out whether the venue has any restrictions on the type of band they have a licence for, or will allow, some venues have restrictions due to having upset the neighbours once too often, if you are planning part of your event in a public space (in a park or public gardens) you may need permission, and you may need to perform a risk assessment. You should not need a licence unless the music is to entertain the public for profit. This band once had to play inside with the windows open while the wedding party was sipping sparkling wine in the garden because no one checked whether bands were allowed to play outside! This band has lead wedding processions etc. and played in public places as part of a private event and because they use no electricity there are minimal risks. Ask the musicians what sort of tunes they play, or ask for a play list so that you can ensure they can play the sort of tunes that you want to hear. This jazz band has a good tune list and clips of the music on its "Tunes" page to help the booker decide whether they are the right band. If you want a specific tune then don’t be afraid to ask, most experienced bands know more tunes than is on their current play list, and given warning may even learn one specially for you. This band once learnt "Sweet Caroline" and an Abba Song - for different events. However, they did not remain in the repertoire. Before contacting the band, try to work out what times you want them to play for, most bands play “sets” between 45 to 60 minutes long with 15 to 30 minute breaks. It is difficult to give a fair quote when the times are given as between 12 and 8 pm but the band is only actually required for 2 hours in the middle. If there is any other down time, like if you want them to play before, then after the wedding breakfast, the fee will be higher and they will probably want food and drink, but not necessarily what you are having, these things are usually negotiable. 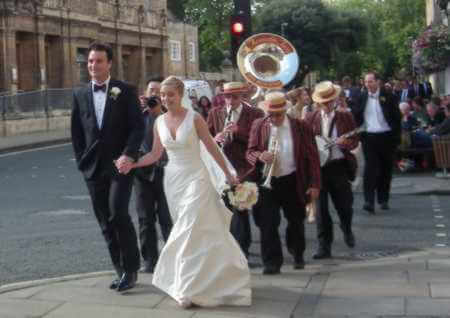 However, when making arrangements for bands to play after the wedding breakfast and speeches, more often than not the event can be running an hour later than anticipated (due to speed of eating and length of speeches). This band has sometimes returned from a break (even after discussing breaks etc with the client) to play one tune and then find that a pause is required for cake cutting, they could have played through and taken their break then giving the client better value. Another thing that needs to be considered is, if you need the band to be set up early i.e. on stage before you have the wedding breakfast, this can incur extra cost. Acoustic Jass does not use usually PA equipment and so can walk on and play or walk on playing if required. Beer stained T-shirts are all very well for a pub gig where they are probably being paid “beer money” or less, so unless this is the dress code then the musicians should be dressed appropriately. Most classical ensembles have evening dress, the more serious ones even sport tailcoats, any band, unless they are starting out should have a form of uniform, and if they don’t there are hire shops. Don’t be afraid to discuss what they will wear, after all every one else including the waiting staff will be smart. Acoustic Jass usually wears Striped Jackets or matching waistcoats and has Tailcoats when a formal 1920’s evening look is wanted. As part of getting to know the band you are going book, ask what events have they played for and, how many a year they do including how many weddings (If you're booking for a wedding). Try to find out if they have some suggestions to make the day run smoother. Keep the organisation simple, things won't run to the minute, pay the band. Don’t be afraid to ask about the length of time the band has been together with their current personnel. Three members of Acoustic Jass have been playing together for over 10 years the forth joined 5 years ago. 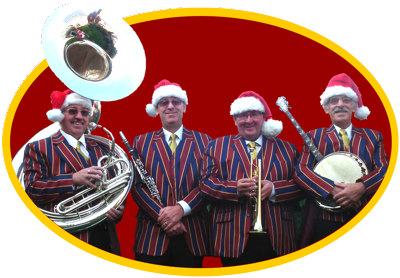 Even musicians have family commitments and take holidays so, good bandleaders have a selection of regular deputies that fit in with the band; however this may mean a slight change in repertoire. This bands repertoire is so varied the audience does not notice. There are many “pick up” or “telephone” bands in which musicians are booked just for the day, this means that the performance may not be what you were expecting. Some people running bands take bookings and pass them on, so that on the day you end up with a no name band when you wanted “Joe Bloggs and The Bloggettes". This is where personal recommendation can help. The Acoustic Jass has many pictures and videos on the web so you should be able to identify them all. You need to know how many are there in the band and do they have any roadies, so that you know how many people to expect if overall space is cramped, or if they need a changing room or you are providing food and drink for them. This band is always 4 people, groupies cost extra, food and drink is always welcome. If the band needs electricity and is playing is out doors or in a marquee a special supply may be needed for them (the caterers can use a lot of power). Attention must be paid to the fact that it may need to be a “clean” supply (some instruments are sensitive to fridges etc. switching off and on). If you want the musicians to perform outside, then this band being acoustic and not needing electricity means that there is less of a problem should it rain. You should also ask how long the musicians take to set up so that the area can be made available accordingly. This jazz band has play at drinks receptions to find the band for the evening entertainment have started setting up, and they were still setting up when they left two hours later. Acoustic Jass take 15 mins to set up, it will take longer if we've more time! Always ask for an “all inclusive” quote and whether any extra’s such as travelling or VAT will be charged. The author is sure that if you are arranging a wedding then you will have discovered the pitfalls of quotes, and what is included or not, long before you get to talk to the band. However, if you are booking through an agent Vat may be applicable to all or part of the Fee. 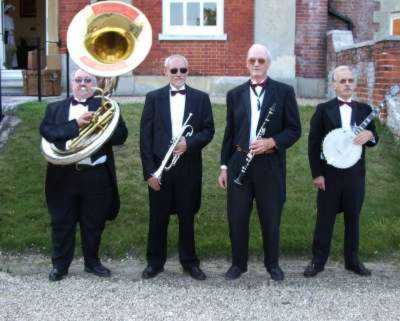 Anyone booking this jazz band direct gets an all inclusive quote and no Vat is applicable. Establish before hand that if you think you may want them to play for longer what the extra fee will be, this avoid embarrassment (on both sides) on the day. 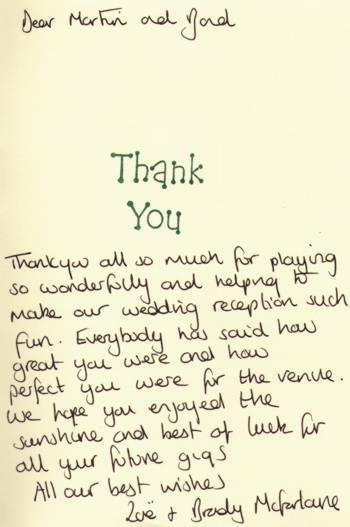 This often happens when wedding speeches run overtime, so it is useful to think about times as being the maximum possibly required, or negotiate with the band to see if they are happy for the times to be flexible. This band has been in situations where they have another commitment and haven't been able to stay on, which is why a discussion of what is going to happen, and is required of them is good at the start then contingency time can be planned in. Be prepared to pay a deposit and, importantly sign a contract or obtain a letter of confirmation that states when the final payment is made, most bands prefer “cash on the day”. If you do pay cash count it into an envelope beforehand so that, "on the day" it may be discreetly slid into the band leaders hand. Acoustic Jass has on several occasions met a "best man" with a wad of cash to pay various people, who by that time had fortified himself for his speech may not be thinking as clearly as usual, it has not always possible to persuade them into a quiet corner to count it out, one occasion was like a scene from a Marx Brothers film fortunately none of the notes had a piece of elastic tied to it. While on the subject of money don’t hire on cost alone, and don’t think because they are the cheapest they are no good, it may local and they appreciate not travelling a long way, or they may charge a lot because there is a 3 hour break between sets. Usually fees are based in someway on the bands time away from home, however some charge a flat fee for wherever they go. This Jazz band has a low starting fee for our local area because they are not spending the time travelling and so get more of the day to themselves or to do another gig. The fee is then adjusted for time and distance to give the best quote. Red tape is something that is increasingly appearing in the form of Licensing (briefly mentioned above), Insurance and health and safety. Public liability insurance is often asked for by the venue and often only at the last minute, any established band should have this, make sure that the band and all members of the band are covered, some musicians have their own as a benefit of a trade association but it doesn't cover the band if one member is not covered. 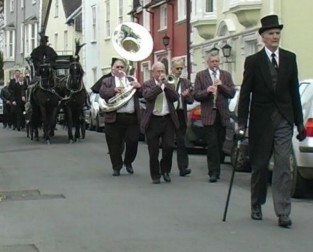 Acoustic Jass carries public liability insurance that covers the band, who ever the players are on the day. Another requirement demanded by some venues is that all electrical equipment has a valid “Portable Appliance Test” (PAT) certificate. This means that every thing the band uses with a 13 amp plug must have a valid certificate. Note, that legally the only time a PAT certificate is required is when the equipment is supplied for employees to use, not for use by the owner, however many venues claim their insurance companies demand it of all electrical equipment. Again, any established reputable band should have this. Acoustic Jass uses a battery powered PA which does not require any testing. And on a lighter note, a question I often get asked is "when should they book the band?" The simple answer is when they are still free, i.e as soon as possible. Bands have to work on a first come first served basis as one date may be booked up two years ahead and are turning people away, and on the following day have no enquiries at all! They have been established twenty years providing good quality live music for entertainment at many events. The music they play is well known traditional jazz, blues, & popular tunes of the early 20th century in the New Orleans jazz style, that appeals to all ages. The traditional jazz style means that the tunes played have a beginning a middle and an end which most people like, and are suitable for listening to (concert) or for dancing. The instruments are acoustic and not dependent on electricity which makes this jazz band versatile as the musicians can move from one place to another easily, however, unless its a procession, they don't walk and play at the same time. The musicians take up little space and play live music for all occasions as quietly or loudly as you wish. As well as their nineteen twenties style striped blazers Acoustic Jass have evening dress tailcoats for the formal twenties theme. 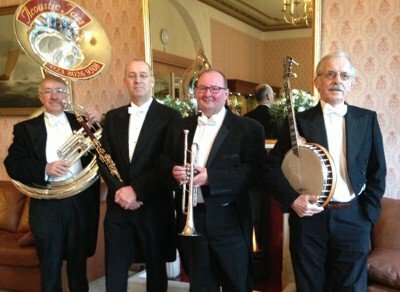 They are equally at home providing the music at a dinner dance or playing in the background at a reception or party. They have played to all size of audience from lunch and dinner parties of thirty people up to seven hundred and fifty at Wembley Conference Centre. They have even played to six people in their front room. Acoustic Jass play live music in the traditional jazz style throughout Hampshire, Berkshire, Dorset, Oxfordshire, Surrey, Sussex, Wiltshire, the New Forest, and the south of England. They have performed at many venues, inside, outside, concerts, corporate receptions, shows, clubs, parties, openings, fetes, promotions, jazz festivals, dinner dances, parades, receptions, weddings, funerals, etc. Acoustic Jass play, presented here in glorious mono!! Acoustic Jass are available to bring their smart professionalism to your event, and, create a friendly rapport with the audience, any time of the day, any day of the week.